ROME/CAIRO, Mar 27 2017 (IPS) - Food security and nutrition levels in the Near East and North Africa have sharply deteriorated over the last five years, undermining the steady improvement achieved before 2010 when the prevalence of undernourishment, stunting, anaemia and poverty were decreasing, a new UN report warns. According to the FAO Regional Overview of Food Insecurity in the Near East and North Africa, issued on March 27, the deterioration is largely driven by the spreading and intensity of conflicts and protracted crises. The assessment made by the Food and Agriculture Organization of the United Nations (FAO) using the Food Insecurity Experience Scale (FIES) shows that the prevalence of severe food insecurity in the adult population of the Near East and North Africa was close to 9.5 per cent in 2014-2015, representing approximately 30 million people. 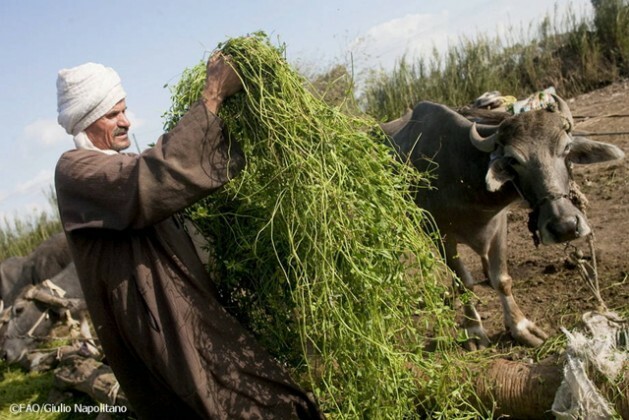 “The region is facing unprecedented challenges to its food security due to multiple risks arising from conflicts, water scarcity and climate change,” said Abdessalam Ould Ahmed, FAO Assistant Director-General and Regional Representative for the Near East and North Africa. José Graziano da Silva, FAO director general, said in a recent visit to Lebanon, “We are reminded once again that war and conflicts are the worst enemies of food security. Lebanon, a small country that has itself suffered the misfortunes of war and internal conflict, has courageously and generously hosted more than 1.5 million Syrian refugees, da Silva added. According to FAO, the Syria crisis in particular has deepened during the period 2015-2016, leaving more than half of the population in need of food assistance and 4.8 million refugees, mostly in neighbouring countries. The numbers of food insecure and the internally displaced are also rising in Iraq and Yemen. Beyond conflicts and crises, the report argues that water scarcity and climate change are the most fundamental challenges to ending hunger, achieving food security, improving nutrition and promoting sustainable agriculture by 2030. Water scarcity is the binding factor to agricultural production in the Near East and North Africa region and the driver of the region’s dependency on food imports. Building on the evidence accumulated in the framework of FAO’s Regional Water Scarcity Initiative in the Near East and North Africa, the report shows that climate change is expected to affect food security in terms of availability, access, stability and utilisation. Most of the impacts of climate change will affect water availability. The FAO Regional Overview underlines the urgency to develop and implement strategies for sustainable management of water resources and to adapt to the impact of climate change on water resources and agriculture. It documents several positive experiences in sustainable management of water resources and climate change adaptation in the region and highlights the importance of accelerating investments aimed at improving water efficiency and water productivity as well as the need for a shift in cropping patterns towards less water-consuming crops. The report explores other major options for the adaptation to climate change impacts on water and agriculture, including the need for designing and implementing social protection measures for building resilience of farmers to extreme events, cutting food losses and improving trade policies. The report stresses the importance of building a strong evidence base for assessing the impact of climate change on food security and for the formulation of sound and flexible water adaptation measures and agricultural policies. It calls for strengthened regional collaboration to face the massive challenge of water scarcity and climate change, building on the strong political will expressed by the leaders of the region and building on the positive experiences in many countries.